Below is my review of 2013's Harrods' Santa. 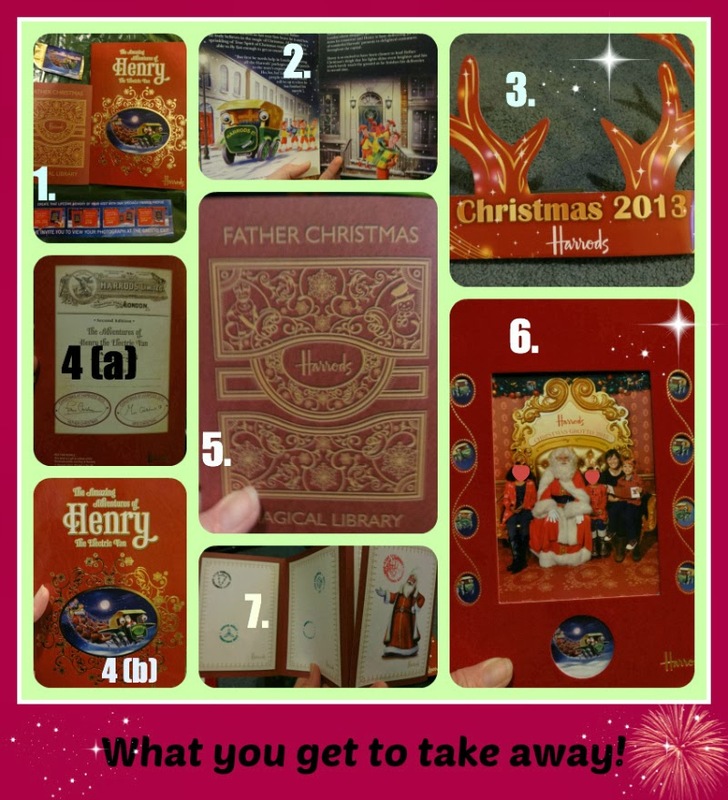 Please find my review of Harrods' Santa 2014 here. This is the beginnings of my review which I will keep adding to. The logistics in terms of booking dates, event dates, opening times, prices, etc.... are here: Harrods Christmas Grotto 2013. I am not going to copy and paste as there is so much info there! Having a look around the store beforehand, and getting in the Christmassy mood in Toy Kingdom, which I would say gives Hamleys a run for its money! Toy Kingdom is on the 3rd floor, so once we were done we popped up to the 4th floor where the grotto is. Choose carefully; for some items they have toys priced at the RRP, but for example, a Gruffalo teddy which I have seen in Kiddicare for £17 was £34 at Harrods! THE WINDOWS. Harrods always gets this right and boy, they did not let us down! I almost want to go again so I can study them for longer and perhaps video them all. I have now included some pics in video below. We brought Aaron's balance bike, as it is our wheels that means we don't require a buggy. Round the back, at door 2a, we were able to leave it in a left luggage department for only £1! You queue before you get to Santa. There were staff, in costumes, every few feet. They were really in the mood, and each and every one stamped each and every child's passport. I will photograph it to show you. Each child was given a safety pin tin badge to wear, which Aaron let me pin on him with pride! Again, I will photograph it. Each child was given reindeer antlers, which Aaron loved wearing. In Santa's room they take a professional photo and they keep taking it till you like it - there is a screen for you to view it on, right there in the room. We only required 2 and were happy with the 2nd. Santa was chatty and cheerful. He had to talk to Aaron and his 2 cousins and made them all feel special. The lady who showed us through to the room knew all of the children's ages. Santa said he's sending an invisible ROBIN home to make sure the children are good until Christmas. It was magical the way the robin tweeted on the palm of his hand. In the "magical library setting" you go through whilst queueing there is a globe, that produces stars on your hand if you stroke it - this felt so magical it put tears in my eyes. You can see it in my video below. There are screens on every wall in the library, so between that, and all the cheerful staff in costumes it is a very cheerful festive queue to be in. When meeting Santa he gives the children a chocolate each and an exclusive Harrods book. The £10 admin fee it costs to book it, can be offset against purchases via your rewards card so in effect it is free (if you turn up!). My Sister in law booked it, so with the £10 she bought things for my nieces. I didn't buy anything in Harrods and luckily Aaron was happy looking at all of the toys, and interacting with them, so didn't demand anything. He was in awe the whole time we were in the store. I was glad of this as I had the £9 cost of a travelcard to get there, £10 on McDonalds and the photos which I will come onto now. There are many packages for the official photo taken. I chose the £28 family option which gives you 1x large print a 4 x small ones. All of them in a STUNNING velvet frame! a pic of everything but I forgot the pin badge which is still attached to what Aaron wore today - ooops! The "book" that Santa gives every child as their "gift". The reindeer antlers that every child is given on arrival to wear whilst in the library and in the Grotto. (a) and (b) the front and back of the "book". The passport that makes traversing the library (queue) so much fun along with the fact that so many costumed staff stamp in and interact really well with the children. One of the small (framed) photos that was part of my chosen £28 package. The frame is velvet and stunning! 3 of the 5 pages in the passport! I'll have to take a pic of the pin badge when I get chance - it is lovely/vintage looking! P.S. 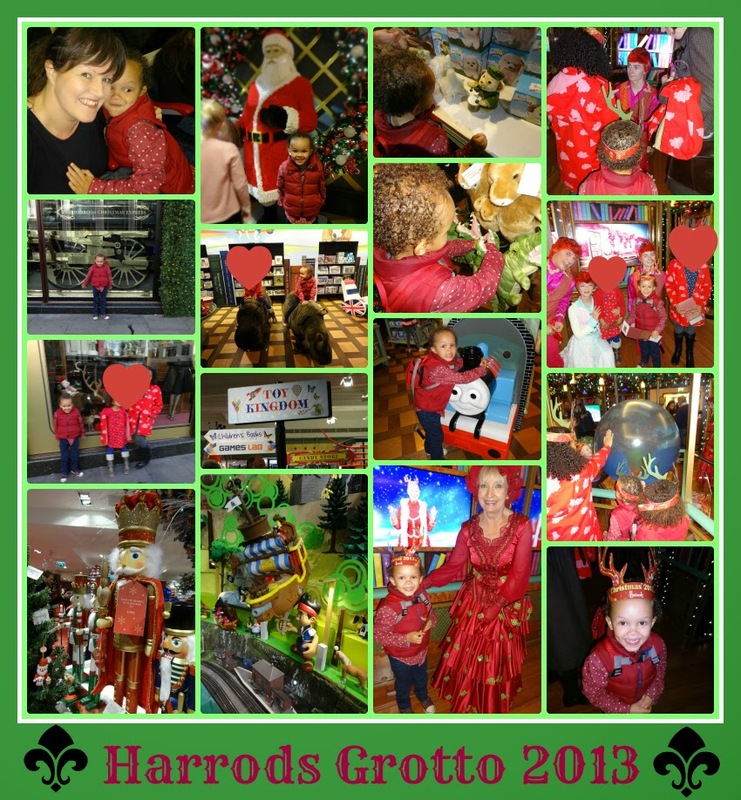 you have to have a Harrods Rewards card to book The Harrods Grotto! Luckily my lovely Sister-in-Law does! The grotto opened yesterday 2nd November, as per the tweet below, but we attended today Sunday 3rd November 2013! Harrods Santas Grotto for 2013 is now sold out! P.S. we are going again in 2014. Hip Hip Hoooraaaahhh! Oh god, I am officailly feeling festive now! Looks fab. Going next month and I cant wait!!!!!!!! Super. I spent 4 hours on the post, as I wanted people (who wanted to read about it to be able to do so). Hi Haribo I have added a video to my post now. Have you been yet? Ohh wow! Looks like you had an amazing time! So magical!! It really is great. Makes you feel so christmassy and it's a shame to leave to go back into the real world. Did you not download the App? We downloaded it from Itunes. It has a video of the dance and a bit that makes Henry come to life (sure that's not the tecchy term but I've not got a clue!). It just extends the day a little bit more. Ohhhhhhhhhh the only apps I ever download are Facebook or Twitter and even those I have to routinely delete as my phone has next to no internal memory to run ANYTHING, so the world of "apps" is passing me on by. THAT sounds awesome though and I am glad you have planted it here for others to see as this post is getting A LOT of views. That looks amazing, I think I will keep quiet now about our Santa Grotto, except that it is free, er well OK when you buy a holiday!